Disabled people are 'bearing the brunt' of funding cuts as a 'vital' service is set to be axed, the boss of a Brighton charity has said. 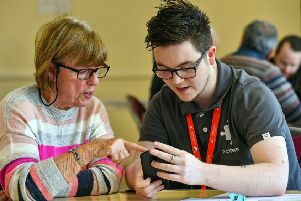 Staff at Possability People have been left 'reeling' after the news that its advice centre is being cut after receiving a letter from Brighton and Hove Clinical Commissioning Group (CCG) and Brighton and Hove City Council. But a spokesperson for NHS Brighton and Hove CCG, said: “Across the NHS there are more and more people who need to use health services and the funding available to pay for them cannot keep up with this increase in demand. This means we have to focus NHS funding on supporting services which have been proven to have the most impact on people’s health and that are not already provided in the community." The Possability People Advice Centre, which has been running for 30 years, helps disabled people with equipment grants, Blue Badges to bus passes, housing, help with care, food bank referrals, welfare benefits and allowances. In 2018, the centre dealt with 2,200 people face-to-face, and handled 4,468 enquiries, the charity said. But now it is set to close after an 85 per cent cut in funding. Geraldine Des Moulins, Possability People’s chief executive, said: “Yet again, disabled people – often the most vulnerable people in our society, are bearing the brunt of funding decisions made without any real understanding of the impact they will have. The service is run by three part time staff and a bank of volunteers - many who are living with disabilities and long-term health conditions. Defending the move, a spokesperson for NHS Brighton and Hove CCG, said: “Over 80 per cent of contacts for this service are related to benefits help and Brighton and Hove has a wide range of other community and voluntary sector services that support people with these needs. "There are also a number of both local and national services that offer benefits advice and help in accessible ways. "With this in mind, we took the difficult decision to reinvest the money that would have been spent for this service into other services that will bring direct benefits to more people’s health needs. This was not a decision we took lightly but we feel it is necessary to ensure we are able to continue to use public money in the most effective way and do not spend more money than we have available. Two of the city's MPs backed calls for the decision to be reversed. Caroline Lucas, MP for Brighton Pavillion, said: “Possability People’s advice centre is a vital service that has supported many of my constituents to successfully challenge incorrect disability benefit decisions, and helped them to get the support they need. "For NHS commissioners to pretend that there isn’t a link between health and wellbeing, and accessing timely disability benefits advice when people are in crisis and struggling to cope, is hugely short-sighted and counterproductive, as I have made clear to the CCG.